Used for 2 position or floating control of liquids either for mixing/diverting service or in systems requiring that the flow be directed from either of two inlets to a common outlet or flow to be directed from one inlet and two outlet. Flow characteristics Constant total flow throughout full seat travel. 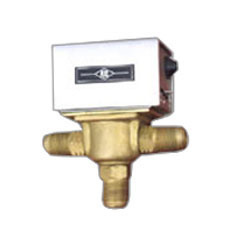 Being a reckoned name in the industry, we are engaged in offering Motorized Valves, applicable for fan coil units. These products are offered in a brass body of a standard size. Our customers can source these sleekly designed products to be used for water line distribution where limited space is available. We have designed these products comprising a small electric actuator for controlling the flow of water or any liquid. Application - used for 2 position of floating control of liquids for ON/OFF , Mixing or Diverting service. 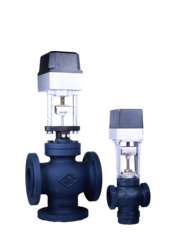 Construction - 2/3 way motorized globe valve with metal to metal seating/soft seating & spring loaded packing.Constant total flow throughout fullplug travel.linkage provides with strain reliaf mechanism assuring tightest possible close-off without putting excesive strain on the motor. Intelligent circuit that senses any hindrance in movement of the valve. Electronic current sensing provides internal protection and positive full closing force. Field configurable jumpers for forward/reverse action. Compact size for easy installation in confined areas. Flow characteristics Constant total flow throughout full plug travel. 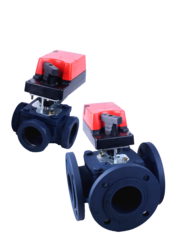 Looking for Motorized Valve ?